For my final — yes, final — excursion for the Month of DDO, I wanted to get back to the roots of doing actual group content instead of just going through quests solo. But even with the group finder going and myself flagged for LFG, I couldn’t find anything level-appropriate. So instead I took on a quest to clear out the Uthe Lodge, a place that’s big on moody rays of light and overgrown flora. Lots of weed whacking in the Forgotten Realms, I gather. Have I mentioned that I love the descriptions in the game? It helps that it’s not bound by the confines of a quest text box, but is free to pop in and out of quests as appropriate. 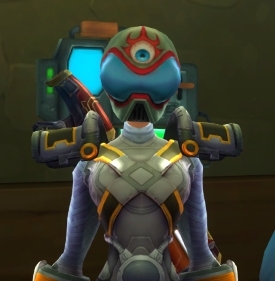 Would love to see this in other MMOs. This whole lodge is full of murky green fog, so it’s not the best picture-taking environment. Anyway, this Woad Troll is the first enemy that gives me any serious trouble, mostly being a meat shield that takes a long time to take down. Actually, it got so dicey there that I had to give up my quarterstaff and revert back to my two knives after this fight, since my knives have a chance of healing me with every hit. It actually feels overpowered to fight with them. This instance is just about as straight-forward and mindless as it can get, at least on the solo normal level. 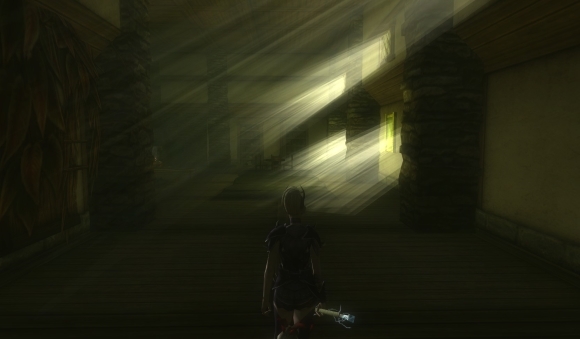 I’m not too fond of the lightning-spewing wisps, since they evade a lot of attacks. Eventually, I start to spot this Bard darting ahead of me — I find out later that he’s a member of the Harpers, an organization that’s revered by fans of D&D and a shoulder shrug from me. Eventually me and Mr. Harper find the (ahem) root of the problems in this lodge: an underground passageway that connects to an evil tree and its evil druid caretaker. Killing this tree is the best part of the quest, because how often are you charged with tree-slaughter in MMOs? I’m not talking about those ambulatory Ent-like beings — just normal, sit-in-one-spot trees. KILL IT! 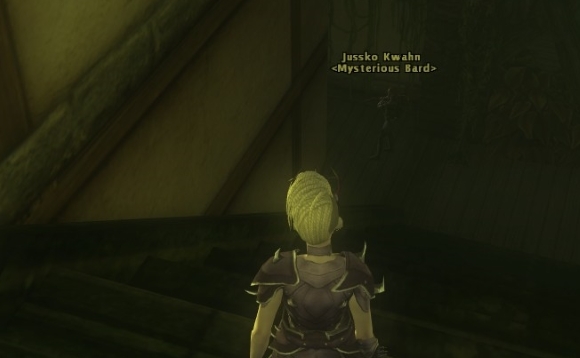 And with that, the quest is over, as well as my month in DDO. 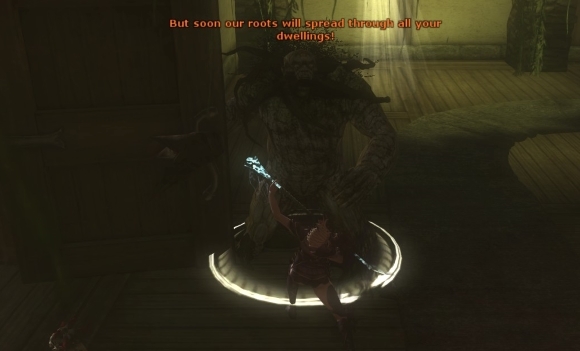 Overall, it was… nice to come back to DDO. I had forgotten how the game felt, and it was good to be reminded of some of its better qualities. The dungeon master narration and the inventiveness of the instances are easily the game’s strongest suits. The boring combat (particularly for the Shardar-kai — click click click click click) and stat flood are its weakest. While I appreciated being able to see the Forgotten Realms stuff with an iconic character, heck if I actually knew anything about my character’s stats, build, or equipment. It’s one thing to grow into a character and learn the game as you go, but to be thrown into the deep end requires a lot of previous knowledge and experience. My DDO sessions never grated, but they lacked the “just one more run” addiction they once held. I don’t regret dabbling back in this title, but for now, I’m laying it to rest. I get the feeling that I’m being followed… must be my imagination, though. More general wanderings in the wilderness for this adventurous chap! I truly wish that this game had some sort of built-in map, maybe one that would fill in as you explored. Sometimes I get lost and disorientated and have no idea how to get back to town. How did I do that? I have no earthly idea. It amuses me greatly that my character faces me and takes a bow. Bravo, sir, bravo! Ugh, I am SO lost right now. What’s worse is that I’m being almost constantly followed/attacked by bad guys, and my health and stamina is almost depleted. Really need to find a safe area to rest and recoup. The good news is that after I finally stumble back to what I think of in this game as “civilization,” I’m able to sell a couple of items to the healer and see that my piggy bank is now 7 gold and 64 silver. No dog food for Victor tonight! 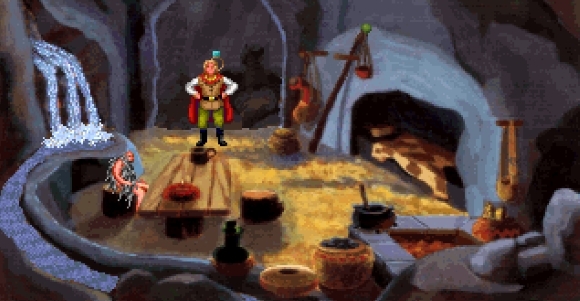 Even better, I’m able to fence the old lady’s stolen necklace for a cool 500 silvers. 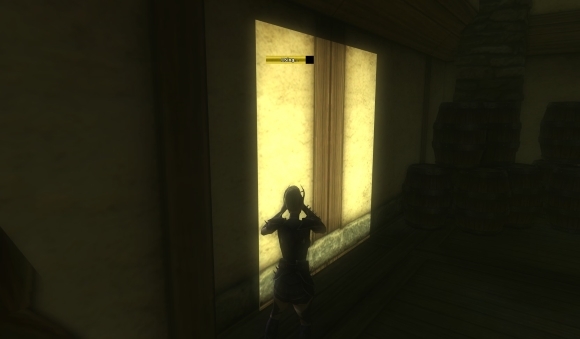 See, fencing is something more video games need for the thievery angle. Makes you really feel like you got away with something big. More aimless wandering. 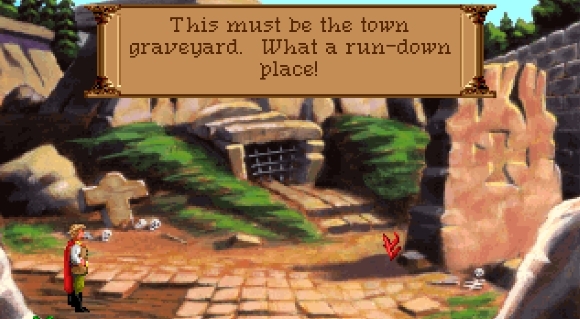 If you haven’t gotten it by now, Quest for Glory is very non-linear. 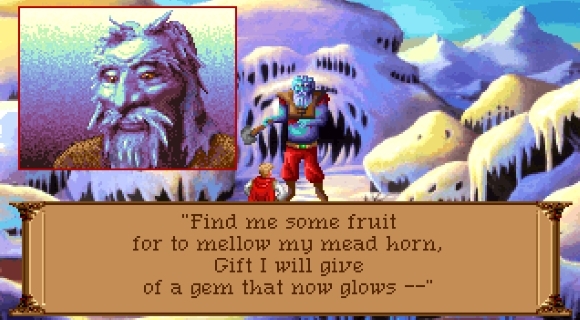 It gives you a bunch of quests and then throws open the door to the world and says, “Have at it.” So I come upon this frost giant who wants a bunch of fruit in exchange for a glowing gem. That’s easy enough: I return to Hilde, buy a ton of apples, and make the exchange. Further explorations turn up the home of ‘Enry the ‘Ermit. He’s been hermiting it up for a long time now, although he does seem quite desperate for company. I really like his cute little cave, although his theme music is even better. ‘Enry doesn’t tell me a lot I don’t know, mostly stuff about being a hermit, about spells (which I’m not interested in), and how he gave a mirror to a murderous warlock OOOPS. My new helmet has a flaming eye on it. ‘Nuff said. I also hit level 25 last night, which was a great milestone level — I not only got my hoverboard (HOVERBOARD) but access to the tier 4 skill abilities. I rejiggered my entire attack sequence to take advantage of this, using flak cannon to quickly get my volitility to 30+, then fire bio shell instantly (thanks to its tier 4 ability), then have so much volitility that I can let off several bolt cutters in a row. It’s a huge damage dump, although I had to take off my stun to make this work. I’m sitting on a pile of gold earmarked for a second age legendary weapon if I see one on the auction house. Actually, I did see a second ager great club, but really, who uses great clubs in that game? Super dorky looking. Just give me a two-handed sword or possibily a halbred, and I’d be happy. Mostly these days I log in to do four or five quests in Gondor, although lately I’ve been concentrating on the epic book before going back to the rest of the content. My daughter was quite concerned that the Nazgul dragon was “bad” and needed to be wiped out, even though the game wouldn’t let me. So yup, I reloaded STO because I’m having a hard time ignoring the upcoming expansion news. It’s one of those “who knows if this will come to anything” game dabblings, but why not. I started up a new Engineer and went through the first quest. It’s good familiarity, although I kind of forgot how much the starter ship is horrible in both looks and performance. Oh well, if I stick it out I have a free rear admiral ship in the bank for later on. The 25th was the two-year anniversary of GW2’s head start, which is pretty amazing to me. Has it really been that long already? Since I still have the character I created that day, I got my birthday gifts. Nothing super-helpful to me right now, but a skill and level booster for a possible alt, as well as a gun that shoots birthday cake. It doesn’t shoot AT birthday cake, it shoots birthday cake OUT. That’s a gun we all should have. If everyone in the world had that gun, universal happiness would instantly break out. Also, lots of food fights. While many soundtrack pieces are a collaboration between an entire orchestra, once in a while a single instrument will take the forefront and steal the spotlight. Those tracks are the theme of today’s show, in which the faithful Bards choose seven MMO songs that feature a dominant instrument. Also, there is much whining because that is what we do best. Listen to episode 34 now! My goal during this past weekend was to put a wrap on Galeras with my Engineer and move on. Galeras isn’t a horrible zone… but it isn’t my favorite, either. The “pretty” parts don’t really stir any feelings in my soul, and the war-torn battlefields and grey canyons are depressing. All the more so that I know that gorgeous Whitevale lays ahead. So I pressed on and finished up the last dozen or so quests. All I had to do after that was to finish up my Scientist path missions. I try to be vigilant in doing these as I go through the zone, but I had three unfinished, with one of those being 14/20 datacubes found. Big sigh and then I hunkered down with an out-of-game map to track down everything, do a puzzle to open a door, ta da, I’m done. It actually was pretty beneficial. I got to level 15 with my Scientist and level 24 with my Engineer (hello bolt cutter!). I’m feeling so much more confident with this class than I was in the first month after launch, not to mention that I’m settling in well with my house and guild. I poked my head into Whitevale this morning before work and my daughter climbed on my lap and helped me spot pearls as we went on a diving mission. She really likes to be my game “spotter”, so I’ll tell her to point out giant spiders and clickies and so on. It’s a good wake-me-up when you have a four-year-old shrieking “THERE! THERE IS ONE!” in your left ear. It really will be nice when my Engine laps my Medic and forges on to a part of the game that I haven’t seen yet. I’m not feeling incredibly anxious about it or anything, but I’ve rerolled enough as it is. It’s time to see new frontiers. Our going-on-two-years-now Battle Bards podcast is probably one of the most involved of my various web projects and a true labor of love from Syl, Steff, and myself. We are nuts about MMO music and have a grand ol’ time jawing about it together, and seeing how the show’s resonated with fans is a treat. But as I said, each episode (which is usually about an hour long) represents probably seven or more hours of our combined time to make. I’m not sure how interested any of you might be in how a show gets made, but since I go through this on a bi-weekly basis, I thought I’d chronicle the making of a show from conception to release. Through discussion and trial-and-error, we came up with a good plan early on that works for us. The very first thing we do is to lay out a plan for the next batch of six shows, with each one of the Bards nominating an MMO-specific episode (i.e. 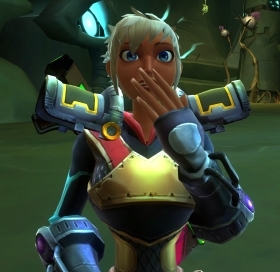 WildStar) and a theme show (i.e. Character Creation). Syl — the ever-organized lady that she is — set us up a group spreadsheet that we use for show planning. On it, we have the upcoming shows with spots for each of our track choices. The rule of the show is that whoever came up with that episode’s theme gets to pick three tracks for the episode and the others only get two. Seven tracks felt like a good “sweet spot” to give us a nice selection without making the show run too long. Another rule we have is not to choose tracks that have already been done or (hopefully) someone’s called dibs on for use in a future episode. Although we’ve messed up on the latter often enough that it’s caused a little bit of eye rolling. As the record time approaches, each of us listens to all of the tracks for the next two episodes (so that’s 14 tracks total) and takes notes, since we won’t actually be hearing the music while we record. Personally, I like to listen and write my notes the morning of so that my memory is very fresh on them. Generally, we record once a month on the second or third Saturday. This requires coordination between Steff and I (eastern time zone in the US) and Syl (who is in Switzerland). For us it’s a Saturday afternoon, but for Syl it’s probably some ungodly hour of the night. Or early morning. I’m not quite sure how time works on the other side of the world. A couple of days beforehand I’ll take a look at the spreadsheet and any of our reader letters, and then put together show notes for everyone. Mostly this is just about the order of the tracks, which only occasionally needs to be handled deftly for various reasons (such as grouping similar tracks together). Because of the hassle of getting three people from two different time zones together, we record a pair of shows back-to-back within a single two-hour block. We set up a three-way call on Skype and I record using my trusty Callburner software (which I’ve been using for three years now for all of my podcasting). It’s not always perfect, but it makes three tracks for each call: one on my side, one on theirs, and one combined. Recording is a lot of fun and we’ve gotten comfortable enough so that we don’t screw up that often any more. Occasionally we have little kids wander in or fire alarms go off or power outages, but we roll with it. I’ll then save the files and leave them for a week or so. The week after we record and then two weeks after that I’ll edit the two shows. Editing is both fun and tedious; it’s really cool to see a show come together, but man does it take a lot of time. Generally, I can expect to take between two to three hours for a single 50-minute show, and that’s if I’m going at a good clip. What takes so long is that our podcast is ambitious with its use of music. Most podcasts will feature an opening and ending song, but the bulk is just talking and requires minimal editing. Ours weaves the seven track in and out of the conversation along with our standard Battle Bards intro, two additional music snippets during the opening talk, and a stinger track. 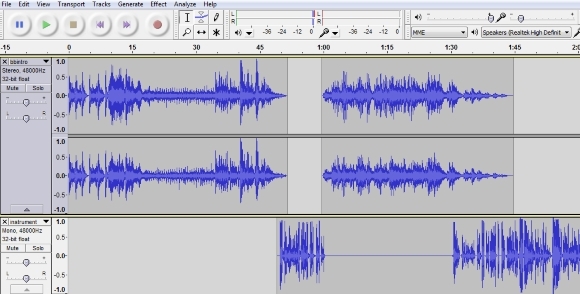 I use Audacity to edit, mostly because it was recommended and it was free. It took me a little while to learn what I needed to know, but now I feel quite comfortable with it. I’ll have three tracks on the screen at any given time: the top one being all of the music in the show, the middle one being our recorded conversation, and the bottom one being the current track that I’ll pulling segments from. I’ve been asked why we don’t just play the full track. Not only would that really interrupt the format of the show (a lot of music then a lot of talking then a lot of music is actually dull) but it would be violating copyright law. Each one of these tracks is owned by someone who is not me, and so we have to be careful about this. Initially I modeled Battle Bards on another podcast called Top Score, which I liked for its professional sound and its love of game music. I reached out to the host and asked her about the usage of music, of which she replied by saying that fair use allows us to broadcast 30-second clips “in the clear” (i.e. with no voices on top of them) for the purposes of review. So that’s what I’ve clung to. Every music snippet is actually around 45 seconds or 1:00, but I’ll only put 30 seconds of it without any voices, with the beginning and end fading in and out. Getting the right parts of the track and making sure that the fade in/out sounds good and doesn’t obliterate our talk, not to mention finding good breaks in our conversation, is that fun/challenging part of editing. So after I finish up with an episode, I’ll add podcast tags for iTunes and other sources to reference, then export it to an MP3. As I’m mixing I’m also working up the blog post/show notes for that episode. I’ll go into Libsyn, our podcast host, and paste those notes into a second blog post (one for Libsyn and one for Bio Break), while also uploading the show to that site. I then set the show to release on 9:00 am on the next Tuesday, zip my co-hosts the links and blog post, and call it a wrap. When the show actually comes out, I’m already well past thinking about it because it’s all automated at that point. The blog post and podcast is pre-scheduled, the podcast aggrigators pick up the new link, and Twitter gets our links out. And there you have it — if I didn’t bore you to death with the details! We’ve got a new episode coming at you tomorrow morning, so stay tuned. And I’m really gelling with this new guild. Good folks who keep piping up to do stuff together. I asked for help with a 5+ group mission and had a level 50 quickly swoop to my aid.